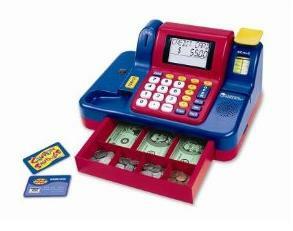 With the Buy It Right Money game, kids go shopping. They use fake bills and coins. They make correct change and practice basic math. The Buy It Right Money Game is a fun money game with (fake) dollar bills and (plastic) coins where children buy and sell items. The game involves shopping carts (represented by cards), dice, a calculator in order to calculate the change, and a 19” X 19” board. Players roll the dice, go shopping with play money, pay and calculate the change (with or without the calculator). In order to win, players have to fill their carts faster than the other players. Children love to play with money and this game has all the elements of an enjoyable money game: dollar bills and coins, an exciting race just like other board games (such as Monopoly). There are 40 bills and 100 coins. The game is designed for 2 to 4 players and for children ages 6 to 9 even though we believe that even adults (parents) could enjoy this game. The Buy It Right Money Game is educational. It is designed by Learning Resources which specializes in educational games. 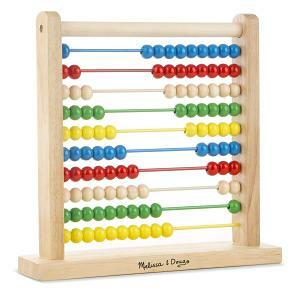 Children have to make correct change which means that they have to count, add and subtract numbers. Just like in Monopoly, children also learn the value of money and the importance of money recognition. Because it is a race, children have to make their calculations fast. Therefore, the game is a great way to practice mental math. The game also involves some problem-solving which is another skill that children can develop by playing Buy It Right. The rules of the game are provided. Make sure that you read them as the game can get complicated. There are actually three levels of difficulty. The first level only uses the bills (which makes it easier to calculate the change and add and subtract numbers) and one die. The second level involves only the coins and two dice. The third level, the most difficult level (for children ages 8-9), involves both the coins and bills and THREE dice. Finally, this money board game is well made. The pieces (the coins, board etc) are good quality and sturdy which means that they can last for a long time which is good if you have many children. 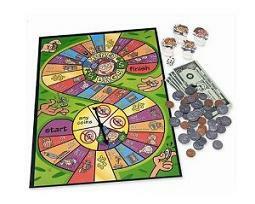 It is also great value for money considering all the fun children can have playing with this board game.